Plan for Inclusion of Women Competitors in Future Events. The Permittee shall submit a plan for the inclusion of women surfers as competitors in future Mavericks surf events, as part of an amendment application pursuant to Special Condition 7. Then in February, several female surfers reached out to the commission. They wanted to give their thoughts on including women in Mavericks. The commission said it received the letter on Sept. 20. A little earlier, on Sept. 9, Mavericks submitted a proposal for the permit that said Mavericks would “reach out” to female surfers and allow them to compete against men if they qualified. Another proposal was sent on October 14* with a note to Ananda that it was “updated.” The update included details for a women’s heat in 2017-18. We are writing to express our concern about the lack of women athletes among those surfers who have been invited to participate in the Maverick’s 2016/2107 event. The morning of Sept. 20, 2016 the Titans of Mavericks announced their first cut of 56 athletes for this year’s contest. The list included four women, but eight days later the second cut of 38 included none. At present, it is possible women might become alternates, but alternates historically have a slim chance of actually surfing. It appears likely that no women will surf at Mavericks this year. Why? The Committee 5’s requirement that women surf against men has created a playing field in which women surfers can be denied entry by an all-male committee who are authorized to judge the exclusion of women as fair and warranted. Our proposal for a Women’s Division makes clear that among researchers and experts in issues of sports and equity, it is widely agreed that women must compete against women in a women’s division. For example the World Surf League (WSL) recently announced 12 women competitors and 7 women alternates invited to compete in the 2016/17 WSL Big Wave Tour. The tour includes both a Men’s Championship and a Women’s Championship. Each division will have their own prize purse thereby guaranteeing that women and men athletes will win prize money based on performance. No mixed gender heats are included in the Big Wave Tour. The refusal of Cartel Management, the Titans of Mavericks board of directors, and the Committee 5 to include a women’s division suggests they do not act in good faith. They are currently enacting a flawed and prejudicial selection process that puts women athletes at a competitive disadvantage and an economic disadvantage. This privilege must be stopped. The organizers’ plan to have a five person all-male committee use their highly subjective criteria to determine the fitness of women for inclusion in the contest smacks of the type of “gatekeeping” that for decades has allowed more powerful political groups to exclude less powerful groups. This is of particular concern to Brown Girl Surf. The commission staff did realize that Mavericks’s early concessions wouldn’t really amount to much and called them out in its summary of events. (In the memo, Cartel refers to the company that manages the Mavericks competition). In terms of women’s participation, Cartel initially suggested an outreach program, and then ultimately expanded that plan on October 14th to agree to create a women’s heat starting in the 2017-18 contest window. Given that this was not consistent with the action taken and direction provided by the Commission in their approval of the 2015 permit, staff discussed this issue with Cartel and indicated that delaying the inclusion of a women’s heat until that time would not be consistent with the Commission’s action, and that staff intended to require a heat starting in 2016-2017 and continuing in all subsequent years of the contest authorized by the amended permit through 2020. In staff’s view, holding a contest without a women’s heat would not maximize access for all, rather it would reduce access opportunities for a specific subset of the population. The $30,000 monetary award is equal to what first-place winner Nic Lamb took home in the February 12, 2016 competition. The competition takes place intermittently on the California coast about 40 miles south of San Francisco, happening 10 times since its inaugurate in 1999. 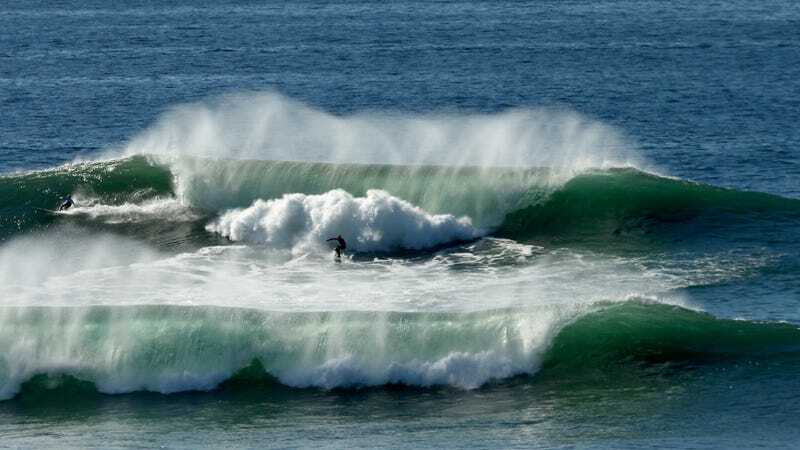 It can take place any time between November 1 and March 31, and the event has been skipped in years when the surf is not suitable during that period, so there is no guarantee that it will happen this year. The invitation only event is announced just up to 48 hours in advance, as soon as conditions show they will be up to par.